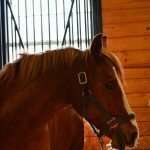 Description: Rocco was born in 2006 with beautiful chestnut coloring and the pie-face that characterizes Arabian horses. The white accents of his blaze and stockings contribute to his distinguished appearance. Personality: Rocco is a wonderful school pony who is always ready to work. His consistency and positive attitude make him a fantastic teacher for intermediate riders. Rocco is eager to please and always willing to jump over anything you ask him to! History: Before coming to NCMT in 2014 after his owner outgrew him, Rocco successfully did his job at a local show barn.